When Los Angeles Kings' center Mike Richards won the Stanley Cup, it marked the ultimate goal in a young career full of championships. Not to be outdone, teammate Davis Drewiske showed off some hardware of his own Monday, when he enjoyed his day with the trophy. Richards, who hosted the Cup in his hometown of Kenora, Ontario, on Aug. 18, became the first player in hockey history to win a Memorial Cup, Calder Cup and Stanley Cup. But Drewiske had some of his own trophies waiting to meet the Stanley Cup. Los Angeles Kings defenseman Davis Drewiske poses with the Stanley Cup as well as his NCAA Championship trophy (left) and Wisconsin state high school championship trophy (right). The day started in Minneapolis with a special visit to the home of Jack Jablonski, the 16-year-old hockey player paralyzed during a game who has since become an icon in his mission to return to the ice. For Drewiske, who suffered a serious neck injury as a junior in high school before being named Wisconsin's High School Mr. Hockey in 2003, it was a special moment. 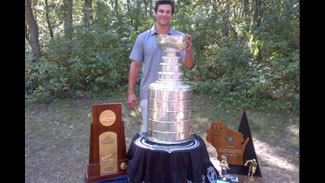 Drewiske then brought the Cup to his hometown of Hudson, Wis., about 30 miles east of Minneapolis. At a public event at the local Hudson Sports and Civic Center, Drewiske made sure to honor the community that helped him get to the NHL. "I thought it was very important for my family and I to say thank you to everybody in the community for all the support that you've shown us over the years," Drewiske told the crowd, making sure to honor the local Hudson Hockey Association, in which he played as a youngster. "I don't think you'll find an association like this anywhere else in the state, maybe anywhere else in the world. I'm very thankful that I grew up in a place like this." It was during the subsequent celebrations in Hudson that Drewiske brought out the hardware. Posing for a photo with the Cup, Drewiske stood beside his Wisconsin state high school championship trophy, one of two state titles he won as a high school player. The photo also included the NCAA championship trophy he earned as a sophomore in 2006 on a University of Wisconsin team stocked with future NHL players, including Joe Pavelski, Adam Burish, Tom Gilbert, Jake Dowell, Jack Skille and Brian Elliott. That team faced a Boston College squad featuring Brian Boyle, Stephen Gionta, Peter Harrold, Nathan Gerbe and Cory Schneider. Indeed, it was a remarkable day for Drewiske, one that ended with the Cup making its way back to Minneapolis, where it will spend Tuesday with Kings scout Tony Gasparini.